Remains of a 13th century fortified stronghold have been found on the site where, legend has it, Scotland's greatest hero was raised. Historical documents and local folklore imply that William Wallace came from Elderslie near Paisley in Renfrewshire, but the claim has never been backed by hard evidence. Now the discovery of a mediaeval fortress on the site has added weight to this claim. Contemporary Scottish archives were destroyed but English records state that he was born between 1270 and 1275, the second son of Sir Malcolm Wallace, a minor land-owning nobleman. This would fit because his family were on a lower rung of Scottish nobility and would have possessed such a building as the one uncovered. Although Elderslie is now covered with modern buildings, excavations carried out by the Centre for Field Archaeology reveal that people have lived on the site for hundreds of years. Using the evidence uncovered by the team, it is possible to recreate in some detail the site at the time of Wallace's birth. Inside a walled enclosure the size of a football pitch would have stood the main hall where the family slept and ate. Beside the hall there were stables for livestock, a small forge next door and a cluster of huts for storage. 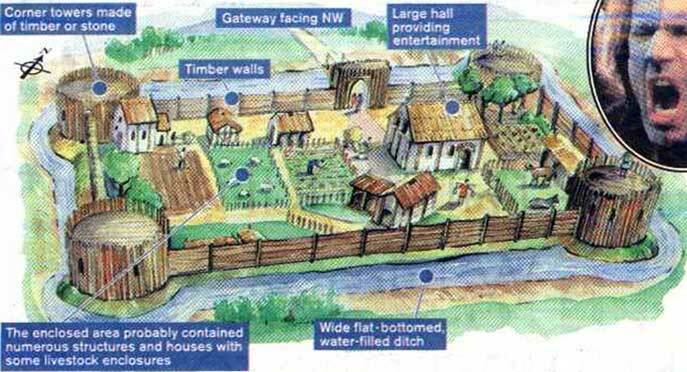 The wooden walls, looking out across the moat, circled small plots of land for grazing and crops. And at the corners of the enclosure stood wooden towers. Before starting to dig, the team examined historical maps of the site including some of the oldest surviving surveys of Scotland made by General William Roy in the mid 18th century, which name Elderslie as Ellerslie. One of the most significant finds was a shard of pottery which experts were able to date as 13th century because of its light green glaze. Details of the dig, funded by Renfrewshire Council, which was completed at the end of last year are due to be published next month in the Glasgow Journal for Archaeology. Derek Alexander, CFA's deputy field manager, said last night: "The idea was to identify remains from the 13th and 14th centuries, contemporary with Wallace, to prove he had been born at the site. 'It was a fascinating task to see if any real evidence could be found to support the theory that he was born at Elderslie.